We have some exciting news for all of you fine people who have been calling us up over the years asking why there isn't an inexpensive plug-and-play solution for controlling stepper motors from a computer. 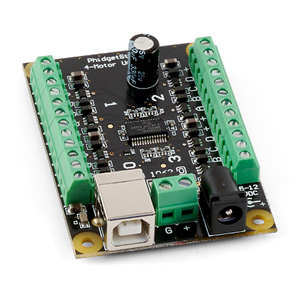 Phidgets has just released the PhidgetStepper Unipolar 4-Motor controller! 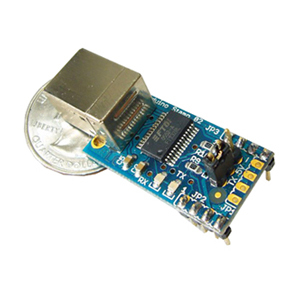 This little board, which is retailing for just $72.74, allows you to control up to 4 unipolar stepper motors from your USB port. Building a CNC rig? Building a wheeled robot that will need fast, precise speed and position control? Buy this controller. The 1062 – PhidgetStepper Unipolar 4-motor, can control up to 4 stepper motors. positioning are well suited for this device. 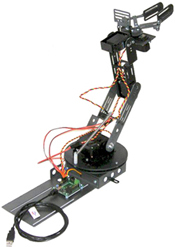 The stepper controller can also run the motor in continuous rotation mode by giving it a large position address. Using the upper position limit as an address would, for example, rotate the motor for 45 years. use the API functions to drive stepper motors,” said Bernard Rousseau, Phidgets Director of Marketing. “We continuously update our documentation in an effort to make it as easy as possible for our users to get their projects going”, added Rousseau. “We already offer Servo controllers, and a variety of DC motor controllers. The arrival of a stepper controller fills a void in our family of motor controllers. ” says Chester Fitchett, CEO of Phidgets. “We have paid close attention to costs in order to give our customers the value/price ratio they are expecting from Phidgets.” added Fitchett. “Unlike a lot of our competitor’s products that require their users to write some firmware code in order to use their sensor, we are completely “Plug and Play” says Bernard Rousseau, Director of Marketing. “With Phidgets, you plug it in and start using it and when it comes to programming, the user, not us, decides which operating system and which computer language he wants to use”, added Rousseau. Users can program Phidgets using a simple yet powerful and well documented Application Programming Interfade (API) that is supported under Windows (2000, XP, Vista), Windows CE, Mac OS X, and Linux. Users can write programs in Visual Basic, VB.NET, C#, C/C++, Flash/Flex, Java, Labview, Matlab, ActionScript 3.0, and Cocoa. 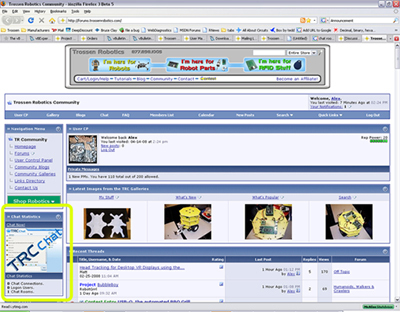 Phidgets also provides programming examples for all its products to help programmers write their own programs. 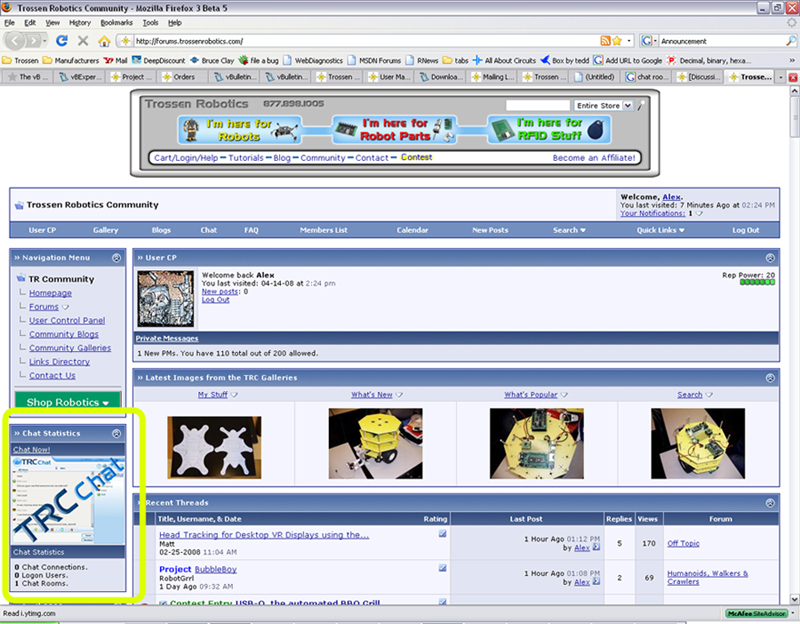 The API Libraries as well as the examples and the documentation are available at no charge on www.Phidgets.com. Pretty slick. This will probably be pretty tough to get when it comes out, but we’ll do what we can. 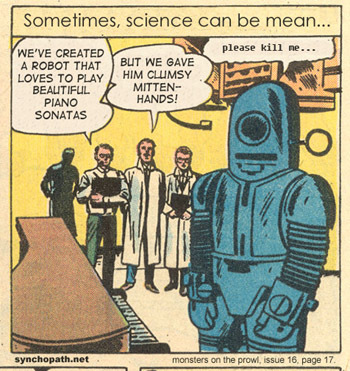 This robot is sad because he has no arms. You can check out thead here. 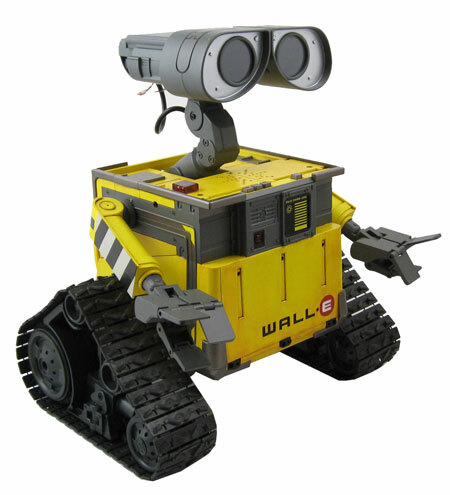 Also worth checking out is the WALL-E Builders Group, an online community dedicated to this kind of thing. 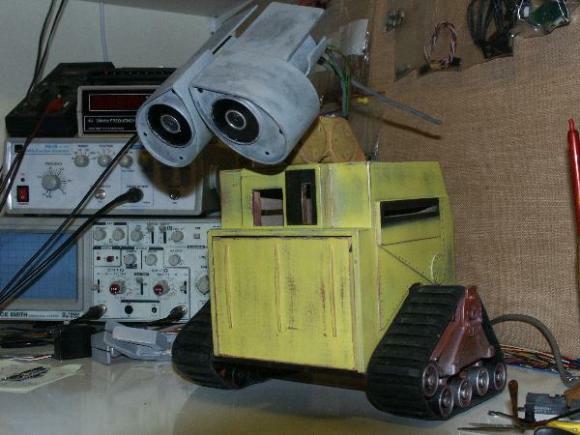 WowWee Wall-E found via Engadget. 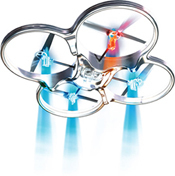 New Products: Hitec R/C, Cool Sensors, and More! 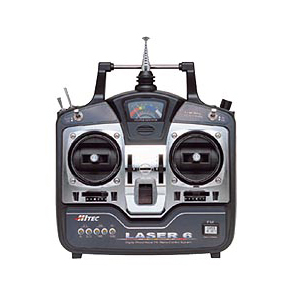 We now sell Hitec’s Laser 6 RC Tx/Rx set. This is the first standard R/C control set to be added to our catalog, and it’s about time. We know that not everybody needs or wants to build autonomous robots, and we’re cool with that. The kit includes the 6-channel Laser 6 transmitter, HFD-08RD 8-channel receiver, and two HS-322 servos. This set offers a great solution for no hassle, plug-and-play control of servos and DC motor controllers. The Robonova 1 humanoid can easily be adapted to work with this controller, too. RC inputs on the Robonova are interpreted as analog values, which can be used to trigger and alter motion sequences in a wide variety of ways. Fun stuff! These touch-sensitive linear potentiometers are really cool. 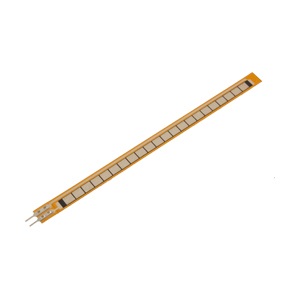 The resistance varies linearly depending on where pressure is applied to the sensor. The pinout is just like any other 3-pin potentiometer, and the pins have a breadboard-friendly pitch of 0.1", so integrating it into your project is a snap. 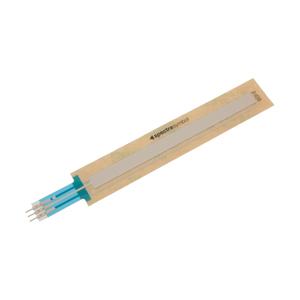 These resistive flex sensors are made of one resistive element, which varies from 9 kOhm when straight to 22 kOhm when flexed 180 degrees. You can use them for monitoring joint angles, as electronic "whiskers," or any other application that calls for a simple, inexpensive flex feedback. For a while now, we’ve been looking for a cheap, simple motion sensor to satisfy the needs of our home automation customers. Well, it looks like we’ve found it. This little sensor is about 1" wide, only consumes a few milliamps, and presents a simple digital output. The sensor outputs 5V when there is no motion, then when it senses something, the output drops to zero. This breadboard-friendly adapter converts USB to TTL-level serial, appearing as a virtual COM port on your computer. It was designed for programming and communicating with the Arduino Stamp, but it also works as a generic serial interface. Do you need to connect some pins to some other pins? Well, then you need some female-to-female jumpers. 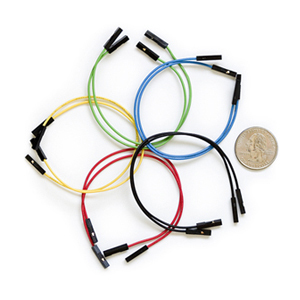 They’re good for wiring up sensors whose pinouts don’t match the connections on your microcontroller or interface board. Now, go buy some stuff, build something cool, then tell us all about it in the forums! You may have noticed that the bulk of the products in this update are SparkFun products. They’re really cool people to work with, they produce and procure a ton of cool and useful stuff, and we keep adding more of it to our catalog, in our quest to bring you the finest products all under one roof. 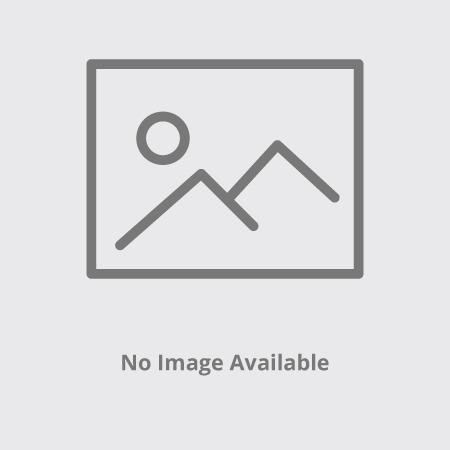 To see all of the SparkFun products that we sell, follow this link to our SparkFun category. 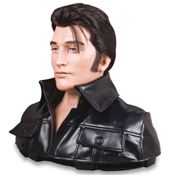 UPDATE: You can also, any time you want, see the 27 most recent products to be added to our catalog. Bookmark it. You know you want to. Stephen Hobley is at it again. His laser harp was cool enough to win second place in our project contest a few months back, and since then he’s managed to make it even cooler. Using a Wiimote to accurately track the positions at which the beams are interrupted, he added some very clean and precise pitch control to the already impressive instrument. Watch the video. After about a minute of demonstration, he gives a quick explanation of how the modification works, so be sure to watch the whole video. 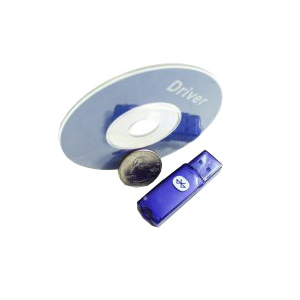 This is a USB-interfaced GPS receiver. The kit includes a Trimble Lassen IQ Receiver, an interface board created by SparkFun, and everything else you need to tap into the GPS network. 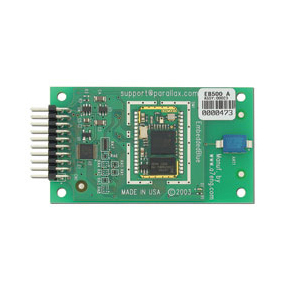 This Bluetooth module from Parallax was designed for easy integration into any Basic Stamp 2 project. It works great with the Board of Educationn, BOE Bot, or SumoBot mini sumo robot. We also offer the Microsoft Robotics Studio-compatible BOE Bot kit, which includes the EmbeddedBlue module. 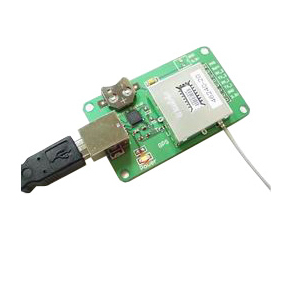 The BlueSMiRF is a very simple to use Bluetooth modem. It acts as a serial bridge, and it’s practically a drop-in replacement for any wired connection. Works great with any microcontroller system, including Arduino and Basic Stamp. 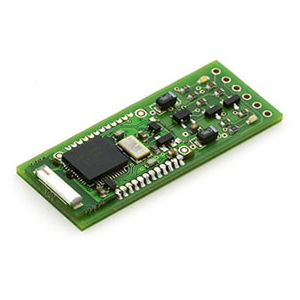 This little jobber is a Bluetooth Wireless adapter for the iRobot Roomba robotic vacuum. Use it to control your Roomba from your computer, cell phone, PDA, or whatever Bluetooth device you happen to be using. Chase your pets, stage Roomba sumo matches, set up synchronized Roomba dance routines… Or you could just vacuum the floor. Whatever floats your boat, man. A simple, cheapo USB Bluetooth adapter. There isn’t much more that needs to be said. Use it to connect your computer to all of your other Bluetooth gizmos. That’s all for now. Stay tuned for another big update next week! After much anticipation (and a few stumbling blocks) we’re happy to officially announce, the Trossen Robotics Community (TRC) Chat Rooms! The TRC is currently in the process of deciding which night(s) are the best for everyone to have some discussions on everything robots. To join in and cast your vote, log into your TRC account and check out this thread. We will continue to move these chatrooms forward, including adding more rooms, setting up topics for discussions, etc.. So get in there and start chatting! We hope you enjoy this new feature, because there are a lot more great features to come in the TRC! After the incredible projects and hard time we had deciding on the winners, we needed a quick cool down from the last Trossen Robotics Community (TRC) contest! As always, for contest details and qualifications please visit our contest page. If you want to see more info, or to drill these guys for more information on their projects, hit up the forums. Kåre’s thread; Matt’s thread. This will create jobs…good ones!This will make us competitive World Wide!This is the way to become the Wal-Mart of mining! It is possible to build an android automiton that is controled by both computer and a cabbage worm.The worm knows how to look for food and eat.If a person designed the control part to reward the worm with a tiny piece of food each time it found the cabbage.The android would then pick the cabbage and put it in the wagon…the worm would then be allowed to search for food again.The cabbage worm would be the controller of choice for picking cabbage.God already put a cabbage monger here with the cabbage worm…might as well enslave them!To think a cabbage worm could do it you realize the wasted human potencial .I think that these androids will give us the tools we need to not waste our God given talents!The developement of a comprehensive applied android program would lay the ground work for major space exploration! Construction crews of androids on the Moon/Mars with the controlers on Earth or a space base/ship. I could see the UN having android observers/or IAEA Inspectors. I can see the day swarms of androids pick produce that is now limited to human pickers[only if they are cheap enough],and operate farm machinery.With the Baby Boomers reaching retirement more workers are going to be needed.The smart egg would get in front of this coming need. Combining our love of androids and cabbage, they approached us and made an offer we couldn’t refuse.